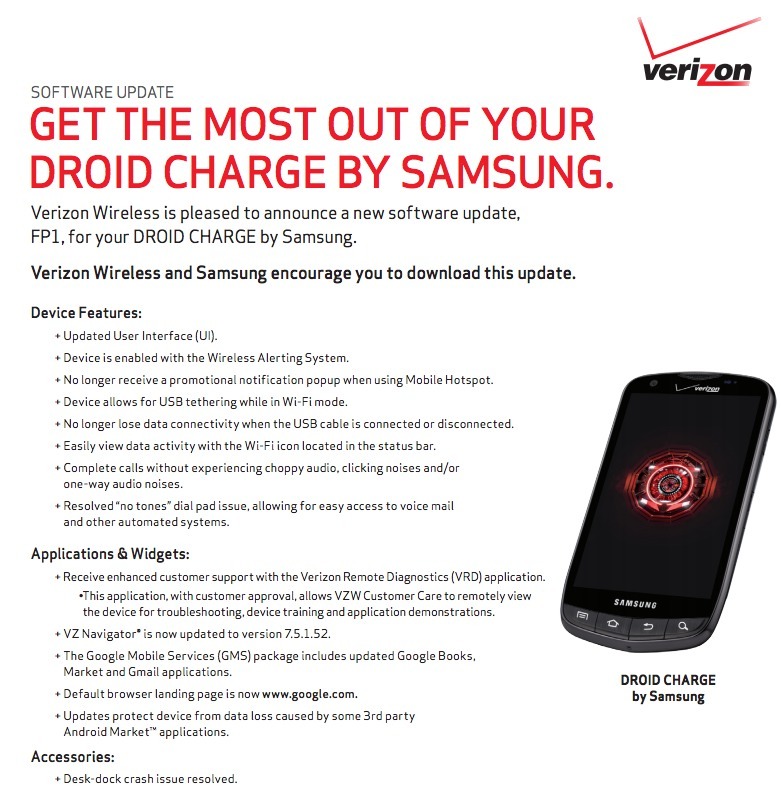 Verizon told us yesterday that other phones besides the LG Revolution would receive their new Remote Diagnostics tool. We sort of expected it to be a bit as they tested the new service on the Revolution first, but it appears now as if the DROID Charge should receive the tool in the coming weeks through a new OTA update. The update is build FP1 and includes an “updated UI” along with a ton of other bug fixes and tweaks to enhance the experience. Really though, this is about the Remote Diagnostics tool that VZW assures us will never gather data or activate without a customer’s approval. I’m still trying to figure out how they can remotely activate it if it’s not running at least in some capacity in the background, but will stop there before the conspiracy theorists show up in waves. Just know that once it arrives via OTA update, it cannot be removed from the device nor can you block it from being installed. It’s bundled into the update. So whether you are interested in their remote help or not, this service will be stuck on your phone. We have a Q&A for this new Remote Diagnostics tool here. More info. The update is 85MB in size.